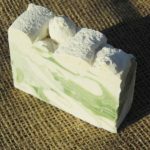 We are very pleased to bring you our gorgeous range of Organic Coconut Milk Cream & Specialty Soaps. They also contain the Organic Coconut Fibre produced as a by-product of our Coconut Milk & Creams, Certified Organic Coconut Oil and Coconut Butter, Pure Virgin Olive Oil, Pure Sunflower Oil and 100% Pure Ricebran oils, Certified organic raw sugars to capture the true depth of both fragrance and moisturising delight! Of course there is also a lot of other delicious and luxurious ingredients in them but most of these are for pure fun and indulgence! We hope you enjoy them. Catch up with us soon on our travels around the NSW Central Coast, Hunter Valley & ACT. Where are we? Now with Certified Organic Coconut Milk, a well as our beautiful Organic Coconut Oil and other all natural gorgeous oils, this is one of our very best sellars. All Australian Lemon Myrtle Herbs add to the beautiful strength of the fragrance and give a lovely light natural exfoliation. 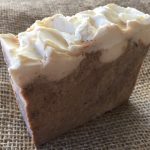 Now all of our soaps include the gorgeous Certified Organic Coconut Milk and Coconut Creams, an extra creamy rich lathering addition to all of our soaps. 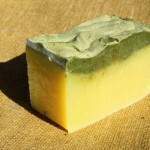 Featuring strong Australian Lemongrass, this soap is one of the top 5 sellers. Great for Camping and safe enough for your Pets! 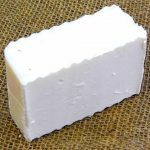 Now all of our soaps include the gorgeous Certified Organic Coconut Milk and Coconut Creams, an extra creamy rich lathering addition to all of our soaps. 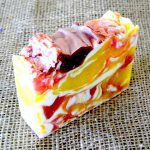 Featuring beautiful floral and fruit salad Frangipani this soap is one of the top 5 sellers. 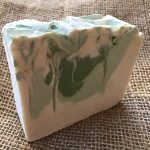 Softly swirling layers of natural clays with pure Australian Tea-tree, not only refreshing but anti-micorbial as well, and perfect for shaving! This is the ultimate strong Raspberry Fragrance crossed with Caramel. A deliciously sweet fragrance of warm vanilla sugar and sun ripened black raspberries: Our new absolute favourite fragrance! You will become addicted to this one, so order carefully! Beware! It has a matching Body Butter – Entrapped!!!! Calling all Vanilla lovers! This Vanilla is not mild or subtle. This Vanilla is strong, buttery, rich and creamy, with sugary rich caramel, undersorced with coconut and tonka bean. This is the real King of Vanillas! 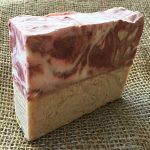 Our beautiful Australian Bush Lavender Soap now made with Certified Organic coconut milk – a strong natural favourite Lavender. 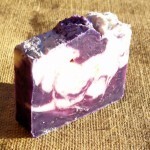 And who doesn’t love a beautiful pure piece of Lavender Soap? The essential oil extracted from the petals of one of the rarest flowers in the world, the Bulgarian Rose Damascena. A beautiful sensuous deep Midnight Rose. Beautiful, soft Lilies, and gorgeous White Roses – a strong floral bed of natural sweet flowers cured with organic coconut milk, coconut oil , rice bran, sunflower and virgin Olive oils, absolutely long lasting with fabulous thick lathering bubbles. Enhance your bathing experience with one of our beautiful high quality Loofahs. A beautiful floral fragrance, so popular with those who love a light yet deep and lasting flower of sweet summer fruits, fruit loops, a mix of candy, violet, roses, wallflowers and sweet wine, fresh and sweet but not sickly. There are so many Patchoulis out there, we have chosen a beautful ‘White’ Patchouli which is deep and fragrant with gorgeous light top notes of Lily. Put this on your next List, we love it! 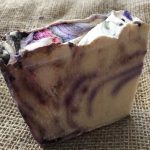 A beautiful fragrant scrubbie soap. 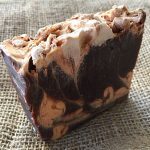 Organic Coffee Beans and Organic Coconut Cream and fibre make the lovely natural exfoliation in this gorgeous soap. Especially for the Coffee lovers, it also contains organic cacao powder for extra moisturising and wonderful smell! A little bit of luxury every day! 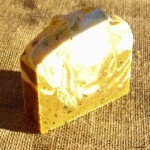 A large cake of camping soap with all the oils needed to keep those bugs off you safely and naturally. Super hard and bubbly for using in hard or salt water, the natural Australian green clay aded for extra cleaning and slip. You can’t go on holiday without this great natural bug off product. 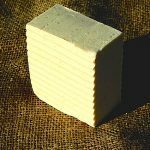 This beautful bar of hard working cleansing Laundry soap was so hard only hours after pouring, we had to cut it rough by hand! That’s a great thing for long lasting lather and stain removal. We guarantee you will love this bar for hand washing your delicates, stain removal on collars, fruit stains and even wine stains. (Don’t leave it too long though!) Safe and gentle it contains organic coconut oil and natural Australian Eucylptus and Lemongrass. Smells exactly like Sea Salt Caramel! A delicious caramel vanilla fragrance with that true Salted twist. Swirled with the aid of only the natural sunscreen, Titanium Dioxide, to create the degrees of caramel colouring. 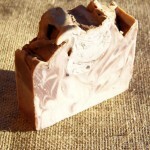 This will soon become your favourite soap if you like rich bubbly lather with a carmel smell. 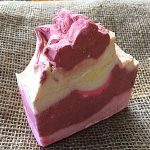 An all time favourite fragrance, the gorgeous smell of sweet fresh strawberries in a sea of creamy champagne bubbles with an underscore of roses, this soap will delight you at once. It’s topped with handmade strawberry soap ganache – what’s not to like? 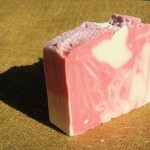 Pamper your best friend with our rich lathering long lasting hard bar of all natural doggie soap. Don’t waste your money on liquid shampoos for your dog, this soap is beautiful and gentle and safe for your special family member. With all natural Australian Lemongrass, Eucylptus Bluegum and natural Australian clays for extra cleaning power, so your best friend is free of all those pesky mites! 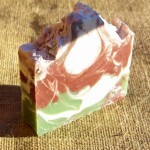 A large bar of Special soap for The Gardener! 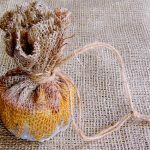 Encased in strong hessian with a hessian string to hang over the outside tap. You don’t have to come inside to wash after gardening. 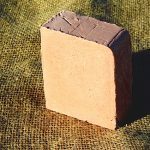 Contains ground Pumice stone for extra grit cleaning, Organic Cocoa and Shea butters with Organic Coconut and Olive oils. You Can’t go past this one if you love Gardening! Here’s one for the Filth Wizard! 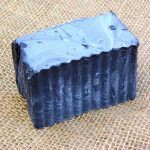 Great also for Mechanics, Gardeners, Miners and Plumbers.With essential oils of Aniseed, Orange, Peppermint, Teatree, & Lemon Ironbark, it contains Organic Shea and Cocoa butters, Volcanic Rock pumice, Organic Coconut Oil and Coconut Milk alongside other skin conditioning oils. A great hard scrub, not for the faint of heart, but its hard work is balanced with its nourishing ingredients. Make sure the filth wizard places it into the soap dish afterwards! 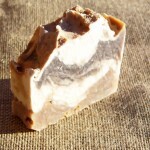 A large bar of Facial Cleansing and Shaving Soap. 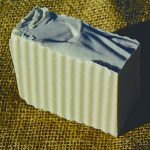 Packed with organic ingredient, Organic OatMeal & Oat Milk, with Organic Oils, alongside nourishing Organic Cocoa and Shea butters, this rich lathering soap bar includes Bentonite Clay and calming Zinc, (a natural sunscreen) for added slip with shaving and additonal cleansing, with Peppermint, Tea-tree, Petitgrain & Grapefruit essential oils. Gentle enough for daily cleansing. 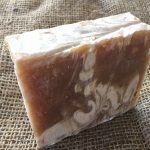 A rich creamy full lathering natural soap with cleansing Clays, essential oils and softening skin oils with Certified Organic Oatmeal & Oatmilk. Can be used for normal facial cleansing and is great for all skin types! 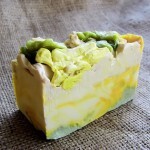 Work a rich lather sparingly into damp skin daily or to remove makeup and rinse well. Finish with our beautiful all natural Vegan & Palm-free Day or Night Moisturisers. SOAP ON A ROPE! 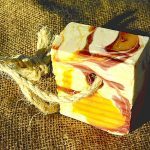 One of our most popular soaps – on a rope for a great no-lose soap. Exactly as it says! Organic Vegan Mountain Goat Beer and Organic Hempseed Milk with Hempseed Oil, Virgin Olive oil, Pure Sunflower and Coconut oils, Ricebran and gorgeous Organic unrefined Shea nut butter, with pure Peppermint, Aniseed and Lemon essential oils. 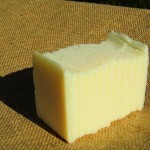 100% Olive Oil (Pure Castile) with 100% Organic Coconut Milk – the Vegan Goatsoap! 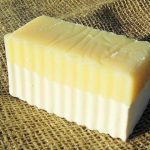 No fragrance, a pure plain bar of soap for those who cannot use anything else. Dermatologists and experts tell us that Pure Organic Coconut Milk is 10 times more powerful than Goatsmilk; kinder to the skin, kinder to the goats, gentle enough for babies and skin problems. 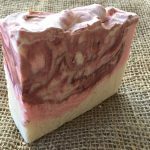 A lovely fresh wake me up Peppermint Arvenis Essential Oil, smells just like the Oddfellow famous peppermints, made with certified organic Coconut Milk and Coconut oil. Just gorgeous. Smells absolutely divine! Beautiful natural scrub. So good for a problem skin and eczema. Contains Organic Oatmeal, Organic Oat Milk and Organic Toasted Raw Sugar. Enjoy the smooth silky feeling of these Organic ingredients fragranced just like it sounds! 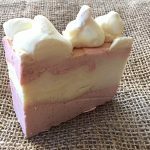 A great block of gorgeously fragranced Marshmallow, our famous signature fragrance – a beautiful Soap fragrance, Body butter and Perfume Body Spray and our new Candle Range – you will fall in love with. Contains our Organic Coconut Milk & Organic Coconut Oils for superior moisturising – a luxury bath or shower experience. 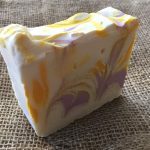 Pure Coconut & Olive Oil Soap with Organic Coconut Cream & Organic Coconut Oils, Olive, Sunflower & Ricebran Oils, fragranced with Coconut Cream you won’t be able to put down! 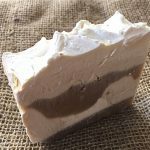 Smelling tantalising of sweet French Pear and tart Green Tea, a beautiful block of soap with rich lather and bubbles and of course our 5% extra Organic Coconut moisturising! 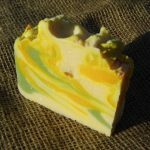 This fragrance is now famous in Soaps and Lotions, smelling like a tropical mix of pineapple and bananas and every kind of sweet delicious fresh fruit and topped with a creamy rich soap icing. ALSO GREAT FOR GARDENERS, COALMINERS, MECHANICS & FILTH WIZARDS! 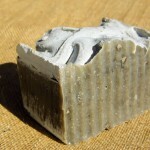 Using pure pumice, a volcanic rock, this exfoliating soap is not for the faint hearted! Perfect to get those grimy hands clean while still leaving the skin on your hands in tact. 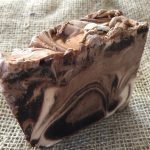 Contains essential oils of Aniseed, Sweet Orange, Peppermint and Lemon Ironbark, all natural antiseptics and as an added bonus we’ve included Organic unrefined Cocoa butter to help with skin moisturising.